Miranda Writes 22 – plotting, writing advice and Flo! So, what’s it like being a full-time writer and full-time mum? Where am I at with work on my sixth novel, I’ll Take New York? I answer these questions in the vlog, together with cracking questions from you on everything from the dialogue and description balance in short stories, how to tighten up a flagging scene (ooh, can be nasty, that…), how I plot my novels, finding a cracking opening scene to what essentials I can’t write without. Oh, and watch out for Flo’s very first vlog cameo! Let me know what you think! And what would you like me to talk about next week? Leave a comment below or email me at mirandawurdy@gmail.com. p.s. As this is a new video camera the picture isn’t quite as good as I wanted it to be, but bear with me and I’ll have it fixed for next week. Miranda Writes 20 – THE BIG TITLE REVEAL! Drumroll please… I am SO excited to finally be able to share with you the title for Book 6 at last! Miranda Writes 17 – Characters, books and BUMP! Most of you will know by now that Bob and I are over the moon to be expecting our first child in March next year. Consequently, this is Bump’s official vlog debut! I also answer your questions on how to build a picture of your characters, my favourite characters and what I loved most about writing Take A Look At Me Now. Miranda Writes 7 – San Francisco sun and sights! All this year I will be documenting the writing, editing and publishing of my fifth novel, giving you a unique, behind-the-scenes look at my life as a writer. This week, I bring you the first of my vlogs from my research trip to San Francisco and reveal the winning KOOKY COFFEE SHOP NAME suggestion for this week’s #getinvolved challenge! While I was there, I filmed lots of footage to help me recreate the sights, sounds and experiences we had for when I’m writing Book 5. You can also read the blog diary I kept (see earlier posts on this site). I’ll be sharing several videos with you over the next couple of weeks – hope you enjoy them! Also in this week’s vlog I’ll reveal the kooky coffee shop name suggestion that is going into the book – keep watching to find out who will get a mention in my acknowledgements. Miranda Writes 4: What’s this about a diner…? All this year I will be documenting the writing, editing and publishing of my fifth novel, giving you a unique, behind-the-scenes look at my life as a writer. This week, the second of your suggestions is announced for Book who has suggested the RANDOM QUIRKY OBJECT that will be appearing in Book 5 (along with their name in the acknowledgements)? And what’s so special about the diner I’ve just written…? YES! 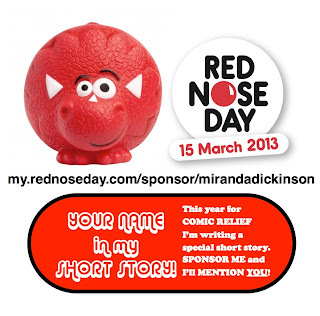 YOU can be mentioned in an exclusive short story I’m writing for Red Nose Day 2013! Simply SPONSOR ME HERE – any amount – and I’ll mention you! It is slightly crazy because I’m going to work in everybody who sponsors me into the short story. At the moment, I’m thinking it will be a little bit like Love, Actually, where I’ll dream up several stories that work together. Please consider sponsoring me – you’ll be helping Comic Relief do their amazing work with people in the UK and Africa who desperately need our help. Thank you! And so, without further ado, here’s this week’s vlog… Good luck, everyone! Miranda Writes 3 – Your Questions Answered! What is the name of the San Francisco cabbie in the story? I had fifty awesome suggestions on Twitter – so thank you so much if you sent one! I announce the winner in this week’s vlog below, so fingers crossed and enjoy! There will be more chances to get involved – watch out for the #getinvolved hashtag on my twitter profile and special requests on my facebook page. And if I use your suggestion, you will get a thank you in the acknowledgements of Book 5! I debated whether or not to reveal this, but I think it’s something that will encourage you if you’re a writer (and show you how important you are if you are a reader!) Over the past two years that I’ve been filming and sharing my vlogs, I’ve always been as honest as I can about the reality of being a writer. As always, I love answering your questions in my vlogs. So if there’s something you would love to know about writing, editing, publishing, my novels, or anything else, leave a comment below, or email: mirandawurdy@gmail.com, chat to me on twitter or leave me a comment on facebook. I’d love to know what you think of the first vlog of 2013 – and my big news!